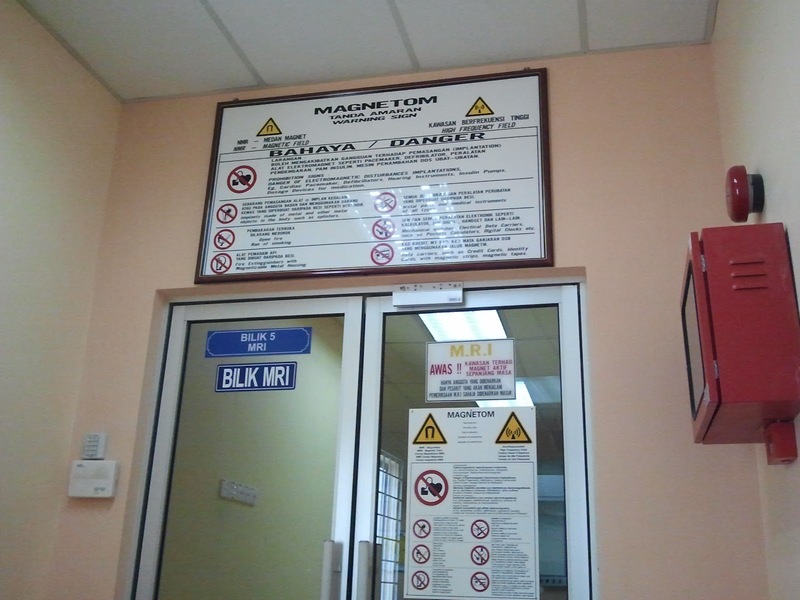 So there we were, the three of us (Afiq and parents) at the MRI section of the hospital last Tuesday afternoon waiting for his turn to go inside the MRI. Prior to this appointment with MRI we had the appointment with the orthopaedic specialist at the very busy Orthopaedic Clinic two weeks before at HRPZ2. I wondered how the doctors and the nurses kept their cool with all the hustle and bustle in the quite cramp clinic treating patients with various orthopaedic problems, some with steel rods poking out from their legs and hands...made me dizzy by just looking! The specialist who attended Afiq is a Chinese Muslim and the number one boss there. My own boss at the office who has to undergo physiotherapy twice a month (for his neck problem) at the same hospital told me we will be lucky if we can get Dr. Annuar Hua himself to examine Afiq's problem. On examining Afiq's x-rays which shows a slight curvature of the spine, he told us Afiq suffers a mild scoliosis but he suspected something amiss with the spinal cord when using the orthopaedic bone hammer on the knees and knuckles Afiq gave swift involuntary jerking motions, thus the MRI to determine what is the real problem that is bothering him. Afiq had to fast for 6 hours before doing MRI and was advised not to wear anything that will attract the magnet, not even 'minyak rambut'. 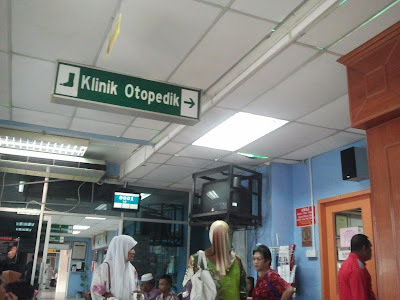 In Afiq's case the thoraxic and cervical parts were scanned. Normally MRI procedures last around 1 hour to 2 hours with the patient lying still inside it and Alhamdulillah his stint in the MRI took less than 1 hour, it would have been less if he had kept still but he moved at one point and the procedure had to be started all over again. Later he told me, he fell asleep while in the MRI. Being a heavy sleeper I am not at all surprised he did that. When asked how he felt inside there, he said.... biaso jah! (nothing to shout about!). Now we are waiting for the MRI results and that will have to wait till the next appointment with the specialist later this month.... another anxious wait. Cari layman language, medical jargons are beyong me. 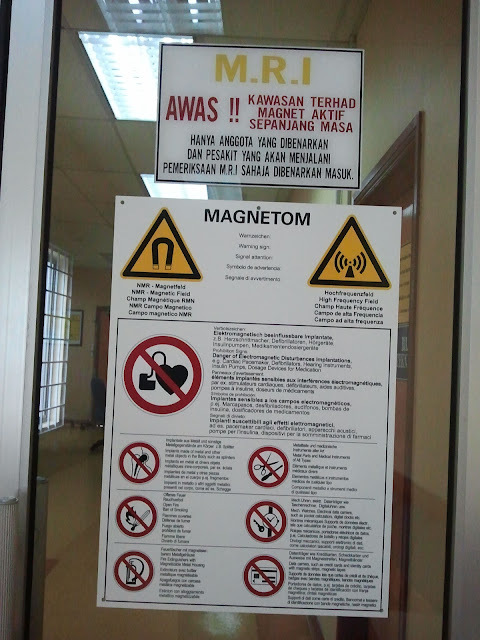 Anyway its better than ct scan n pet scan. Before going into these machines, you need to take awful dye liquid and injected into your body something l don't know but l was being isolated in a radiation room to have it injected. Rasa nak jadi a bionic person with radiations in your own body. Semoga kita dapat khabar bahagia nanti. Your condition is different frm Afiq's. Nasib baik tak ada complications masa MRI, everything smooth sailing n lucky he is not claustrophobic abt being in a narrow confined space too. Insya Allah kita sama-sama doa untuk khabar bahagia. InsyaAllah Afiq takdok gapo2 nyakit!